Human Hair Extensions In Good Condition? "Which products should I use to keep my clip in human hair extensions in good condition?" Caring for clip in human hair extensions can be divided into three areas; daily styling (which includes grooming, styling products and moisturising), washing and lastly, nourishing; which includes conditioning the hair and using oils. Human hair (whether growth, wig or extension) needs moisture, lubrication (oil) and protein (conditioners); all these elements care for and nourish hair to keep it healthy, supple, soft and strong. Not all oils are absorbed by hair (like mineral oil which only ever sits on the surface of the hair and traps dust and odours...boo! ); and some oils are absorbed more than others so they lubricate the hair internally and keep it supple and smooth. A good oil to use on hair is one that penetrates the hair shaft. An even better oil to use on hair is one that can repair the hair and strengthen the hair by preventing protein loss. The best oils (and butters) to use on hair are derived from plants and include almond, argan, avocado, castor, cocoa, coconut, jojoba, olive, rosehip and shea. 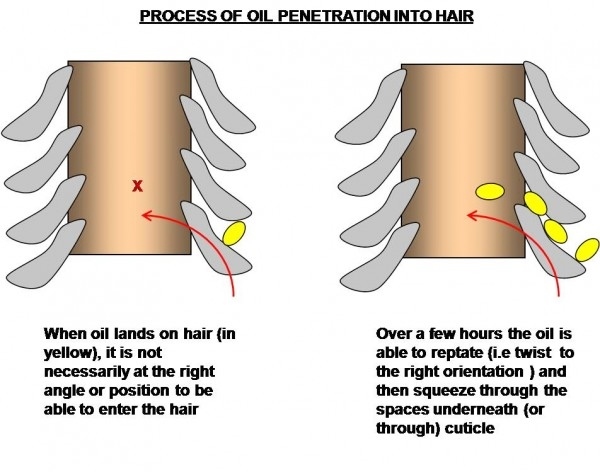 Here are two ways to use oils on your clip on human hair extensions. Use a water-based moisturiser that contains plant-derived oils or butters and doesn't contain mineral oil and lightly mist your (dry) clip on human hair extensions. Apply a small amount of oil to damp hair (after washing) to seal in moisture. Use a wide tooth comb or your fingers to distribute and smooth onto the hair. Hair is mainly made up of protein and it's the protein in hair that makes it strong. Conditioners are used to replace lost proteins, repair and strengthen hair; but protein conditioners have another feature that actually works against hair; protein dehydrates hair. Dehydrated hair becomes brittle leading to breakage and split ends. This is why a good conditioner should also contain oils to seal in the moisture (water). If it doesn’t then the hair should be moisturized after deep conditioning - especially if the hair has been chemically processed or is very curly (curly hair is more porous and loses moisture easily). Here are two ways to condition your clip on human hair extensions. Lightly mist your clip on human hair extensions with a leave-conditioner twice a week – if the hair seems dry then do this once a week. Deep condition your hair after washing it; apply conditioner to damp clip in human hair extensions, then place in a sealed plastic bag and leave for up to two hours before rinsing. If you want deeper conditioning, then put the sealed plastic bag in a basin with warm (or hand-hot) water for about 15 minutes and then rinse. Deep condition your clip on human hair extensions every two weeks if you wear them every day and remember to moisturize afterwards as protein can dry out the hair. That’s a wrap on nourishing products and techniques. The links at beginning of the guide will take you to articles about daily styling products and tools as well as easy to follow washing methods for clip in human hair extensions. For more information, check the Hair Extensions Q&A section or to find out about new articles and guides about hair extensions, wigs and hairpieces then join our blog.